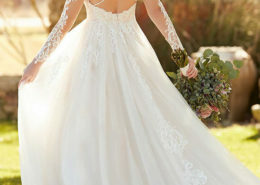 From Essense of Australia, this designer wedding dress, made of lace and crepe, feels vintage in nature but modern in design. A lined, illusion back pairs perfectly with a heavily beaded bodice made of scrolling French lace. The floating back straps offer a unique take on backless wedding dresses. Deep side cutouts with bold seams create shape, while the clean lines of the crepe skirt contour the body. 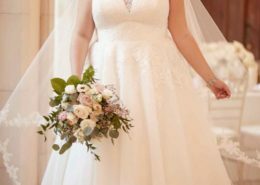 A plunging neckline rounds out this vintage-inspired wedding dress. The back of this column wedding dress zips up under sleek fabric buttons, for a polished and clean look.